Si a ustedes les pasa como a mi, que a veces no se que incluir en la lonchera de Gabriel o tener en casa como snack, y que además sea nutritivo pero delicioso, aquí les comparto este snack que nos encanta a ambos. / If you happen to be like me, sometimes I do not know what to include in Gabriel's lunchbox or have it at home as a snack, that cab be also nutritious but delicious, here I share this snack that we love both. Primero voy a mencionar que a los 5 años, los niños tienen su propia personalidad y ya no es como antes que se comen todo lo que mamá les da sin preguntar. Ahora dicen cuando algo le gusta o no y muchas veces se reusan a probar cosas nuevas. / First I will mention that at age 5, children have their own personality and it is no longer as before they eat everything that Mom gives them without asking. Now they say when they like something or not and often refuse to try new things. En el caso de Gabriel ha dejado de probar todas las frutas que le daba y ahora solo le gusta sandía y el guineo solo en batido o pancake, del resto no quiere saber. Para no aburrirlo dándole siempre lo mismo, entonces alterno las loncheras con vegetales que sí le gustas: tomate, pepino, tortitas de huevo con hongos, brócoli, coliflor, espárragos o pimentón, etc. / In the case of Gabriel, he has stopped trying all the fruits that I gave him and now he only likes watermelon and the banana alone in smoothie or pancake, the rest does not want to try. So in order to not bother him, giving always the same, I alternate the lunch boxes with vegetables that he likes: tomato, cucumber, frittata with mushrooms, broccoli, cauliflower, asparagus or bell pepper, etc. Otra opción que le gusta y es la receta fácil que les compato hoy, son los Sugar Snap Peas, conocios como guisantes. Estos son los que vienen gorditos, ya que los chatitos son Snow Peas, pero tienden a quedarme aguados, si tienen tips me los pueden dejar en los comentarios. 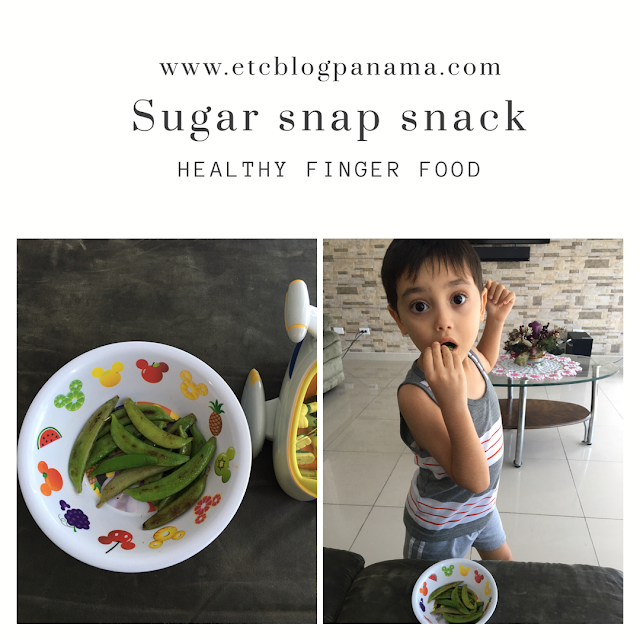 / Another option that he likes and is an easy recipe that we are sharing today: the Sugar Snap Peas. These are the ones that come rounded, since the flats are Snow Peas, but they tend to get watery, if you have tips on how to cook them please leave a comment. Es muy fácil: se lavan, secarlos en papel toalla, se les quita la vena de los extremos, se saltean en el sartén con un poquito de aceite de oliva, sazonar con sal de ajo, también los pueden sazonar con sal y pimienta. Después de 5 minutos, salteando de un lado y otro, se sirven en un plato y listo se sientes crujientes! / It is very easy: wash them, dry them in paper towels, remove the vein from the ends, sauté in the pan with a little olive oil, season with salt of garlic, can also season with salt and pepper. After 5 minutes, sautéing from one side and another, served on a plate and ready! you can feel them crisp! Este es un snack rico en vitamina A, C y en Hierro. / This is a snack rich in Vitamin A, C and Iron. Que lo disfruten! / Enjoy it! Publicado por Concepción Amaya en 8/06/2017 07:15:00 p. m.